Born in Tôkyô, Asakusa, the 2nd of May 1884. Eldest son of Sawamura Tosshi VII and brother of Sawamura Sônosuke I and Sawamura Chôjûrô VII, he made his debut on stage (hatsubutai) in May 1886 at the Azumaza. He received not a Sawamura name but the name of Suketakaya Kodenji I in order to keep the family name of Suketakaya alive as his latest holder was Suketakaya Takasuke IV passed away the 2nd of February 1886. He tourred with his father to Naogya in December 1892 and they performed in 1893 in Ôsaka. When they went back to Tôkyô, Kodenji became the zagashira of a troupe of kodomo shibai performing at the Miyatoza, later at the Shintomiza. He passed away the 24th of August 1899. Born in Tôkyô, Asakusa, the 22nd of January 1909. He was a nephew of Sawamura Tosshi VII. He started his career in March 1913 at the Imperial Theater, where he received the name of Sawamura Chamemaru and played the role of Komawakamaru in the drama "Sakaro". He took the name of Sawamura Harunosuke in April 1925 at the Mikuniza in Asakusa. He finally took the name of Suketakaya Kodenji II in July 1927 at the Kabukiza, where he performed in the drama "Sano no Yatsuhashi". He joined the troupe of Ichimura Uzaemon XV. He joined the troupe led by Onoe Kikugorô VI in 1947 and became a member of the Onoe Kikugorô Gekidan from 1949. 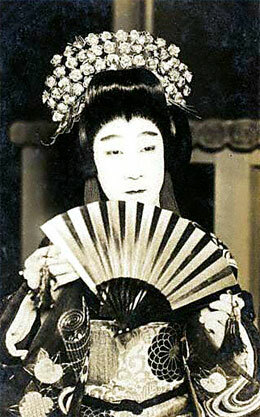 He received the Shôchiku President Award (Shôchiku Shachô Shô) in October 1954 for his performance in the role of the rônin Komori Magoichi in the drama "Ninjô Banashi Koban Ichiryô". He appeared on stage for the last time in December 1992 at the Kabukiza, where he performed in "Ippon Gatana Dohyô Iri". He retired after more than 79 years of acting and he passed away the 20th of February 1992. 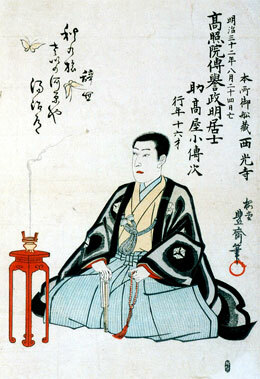 As a supporting actor, he excelled in important roles like Yazaemon ("Sushiya"), Kurosuke ("Sanemori Monogatari"), Rokurôdayû ("Ishikiri Kajiwara"), Yamana Sôzen ("Meiboku Sendai Hagi") or Hamamatsuya Kôbê ("Benten Kozô").